The tally of potentially habitable alien planets may have to be revised downward a bit. To date, NASA's prolific Kepler space telescope has discovered about 30 roughly Earth-size exoplanets in their host stars' "habitable zone" — the range of orbital distances at which liquid water can likely exist on a world's surface. Gaia launched in December of 2013 to create an ultraprecise 3D map of the Milky Way. So far, this map includes position information for about 1.7 billion stars and distance data for about 1.3 billion stars, according to NASA officials. Gaia's observations suggest that some of the Kepler host stars are brighter and bigger than previously believed, the officials added. Planets orbiting such stars are therefore likely larger and hotter than previously thought. The "hotter" issue is straightforward: A larger, brighter star pumps out more heat. The "larger" correlation stems from Kepler's planet-hunting strategy, which is called the "transit method." Kepler notices the tiny brightness dips caused when a planet crosses its parent star's face from the telescope's perspective. Estimates of such planets' sizes are derived from the percentage of the stellar disk they block during these "transits." So, if the stars' diameter is revised upward, so is that of the planet. "The whole issue has always been, how well do we understand the star?" Eric Mamajek, deputy program chief scientist for NASA's Exoplanet Exploration Program, said in a statement. "This is just another chapter of that ongoing story." The new results shouldn't discourage folks hoping that Earth life isn't alone in the galaxy; there's still a lot of potentially habitable real estate in the Milky Way, NASA officials stressed. But the Gaia data reinforce that astronomers, astrobiologists and planetary scientists still have a lot to learn about exoplanet habitability. "We're still trying to figure out how big a planet can be and still be rocky," Jessie Dotson, an astrophysicist at NASA's Ames Research Center in Silicon Valley, said in the same statement. Dotson is the project scientist for Kepler's current, extended mission, which is known as K2. And then there's the concept of the habitable zone. Basing habitability solely on orbital distance ignores important planetary characteristics, such as mass, which influences a world's ability to hold onto an atmosphere. Then, there's atmospheric composition, which greatly affects a planet's temperature. The $600 million Kepler mission launched in March 2009. During Kepler's four-year primary mission, the telescope stared at about 150,000 stars simultaneously, watching for planetary transits. This work ended in May 2013, when the second of Kepler's four orientation-maintaining reaction wheels failed. In 2014, Kepler began K2, during which the craft observes a variety of cosmic objects and phenomena over shifting 80-day "campaigns." Some of these campaigns involve planet hunting; indeed, 354 of the spacecraft's 2,681 confirmed alien-world discoveries to date have come during K2. Kepler's total tally represents about 70 percent of the roughly 3,800 known exoplanets. 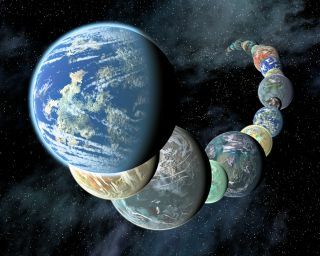 And the Kepler count will continue to grow; nearly 3,000 planet "candidates" await confirmation by follow-up analysis or observation, and history suggests that most of these will end up being the real deal. But Kepler's observing days are drawing to a close. The spacecraft is extremely low on fuel and recently went into a "no fuel-use" sleep mode.